Keep in mind as you read this post that you can enlarge the photos depicted here by placing your cursor over them and clicking. It is amazing what we can find in our own back yards (or on our barn apron). It turns out that this insect can be found just about everywhere in south Texas, all along the Gulf coast, and throughout Florida. It doesn’t confine its activities to the U.S., either, but is found in even greater numbers in Mexico, Central America, and south, all the way to central Argentina. It is a member of the order Hemiptera (the true bugs); the suborder Heteroptera (with hardened elytra, or wing coverings, over membranous wings); the infraorder Cimicomorpha (a subset of the Heteroptera comprising assassin bugs, plant bugs, lace bugs, damsel bugs, minute pirate bugs, and bed bugs); the family Reduviidae (named for the genus Reduvius “hangnail or remnant,” a large, cosmopolitan family of predatory Heteroptera that includes the assassin bugs, wheel bugs, and thread-legged bugs); the subfamily Harpactorinae (the assassin bugs, presently comprising around 300 genera and between 2000-2500 species worldwide); the tribe Harpactorini (the most diverse of the Reduviidae, comprising 289 genera and 2003 species worldwide); the genus Zelus (first described by the Danish biologist Johann Christian Fabricus in 1803, comprising 60 described species); and the species Zelus longipes (an assassin bug characterized by its bright reddish orange coloration). 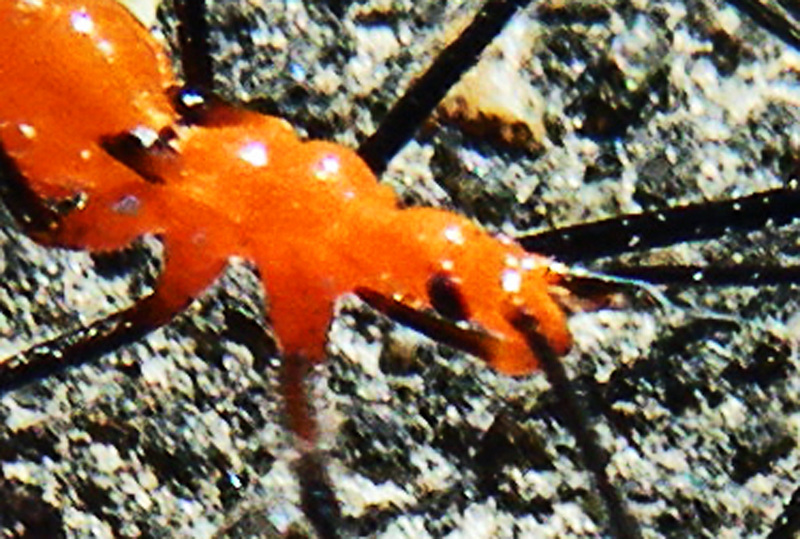 A rather diminutive insect, the milkweed assassin bug is not noticed by most until, often while weeding in the garden, a chance encounter with this otherwise beneficial insect results in a painful bite. Some keep these as pets; others rear them as beneficial insects (a tricky enterprise, as they tend to be cannibalistic) that they release into their gardens, cornfields, and around their yards to control aphids and caterpillars. Obviously, the good they do far outweighs the risk of a rare bite. Furthermore, bites are not a worry unless one happens to handle one of them roughly or carelessly, as they normally will not bite large animals like humans except in self-defense. The sharp pain that then occurs comes from the insect’s piercing/sucking mouth parts. You can see those mouth parts in the photo at left, though the morphology of the head is so unusual that it may be difficult to comprehend what you are seeing. In the photo (which can be enlarged by clicking on it) you will notice that the antennae attach rather forward of the eyes, and that the anterior head has a squarish aspect, from whose anterior at the left and right side projects backward a darkened, pointed, process of some length. Notice the two dark spots at the insect”s waist. These are wing buds which will, when the insect matures, become wings. This is an immature specimen; the juveniles molt 4-7 times between hatch and maturation. 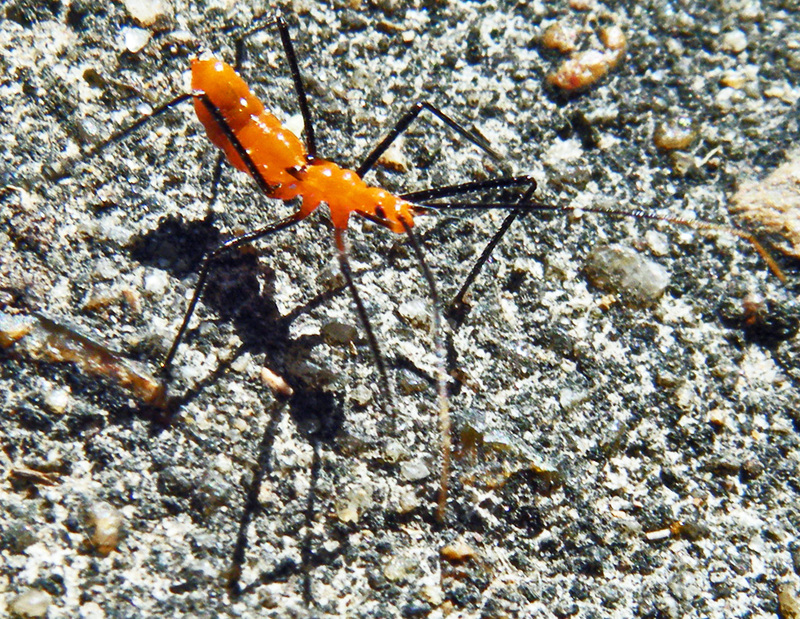 The Missouri Conservationist ran a series of articles on assassin bugs in May 2010. Oh wow! Finally! they look like little aliens! Somewhat friendly too. I didn’t bother them until recently I killed one and have felt horrible ever since. I see all these aphids and spider webs and assumed after a year that THEY were the culprits. Why aren’t they killing the aphids? Deana: they are most likely killing many of the aphids, just not all of them. That’s the way nature works, a kind of stasis is established that allows prey and predator to coexist in a kind of uneasy equilibrium.